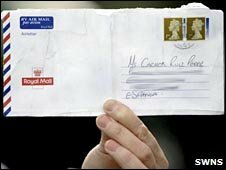 A Devon man has married an old flame after a love letter he wrote 10 years ago which went astray was discovered behind a fireplace by workmen in Spain. Steve Smith, of Paignton, met Spaniard Carmen Ruiz-Perez 17 years ago when she was an exchange student in Devon. The pair had been engaged but their relationship fizzled out after Ms Ruiz-Perez went to live in Paris. Mr Smith sent her a letter via her mother's home in Spain but never heard back until she read it a decade later. Ms Ruiz-Perez, who had never married, rang her former boyfriend and they met in Paris a few days later. Like a storyline straight from Hollywood, the pair, now both aged 42, fell in love all over again and tied the knot in Brixham on Friday. Mr Smith, a factory supervisor, said: ''When we met again it was like a film. We ran across the airport into each other's arms. ''We met up and fell in love all over again. Within 30 seconds of setting eyes on each other we were kissing. However, it seemed that Cupid and fate worked hard to ensure it did as a catalogue of events could so easily have led to them never meeting again. Mr Smith originally wrote to Ms Ruiz-Perez's flat in Paris but she had moved and his letter went unanswered. Still determined to trace his lost love, he wrote her another letter and sent it via her mother's villa in Spain. The letter was put on the mantelpiece and forgotten about before it slipped down the back of the fireplace. It was only when workmen carrying out renovations on the villa removed the fireplace that they discovered the letter and passed it on. However, it was 10 years old and Mr Smith had moved house - but fortunately he had kept his old phone number. Ms Ruiz-Perez, who has now become Mrs Smith, described the wedding as the pinnacle of an ''amazing'' love story. "I never got married and now I've married the man I have always loved," she said. ''When I got the letter I didn't phone Steve right away because I was so nervous. I nearly didn't phone him at all.